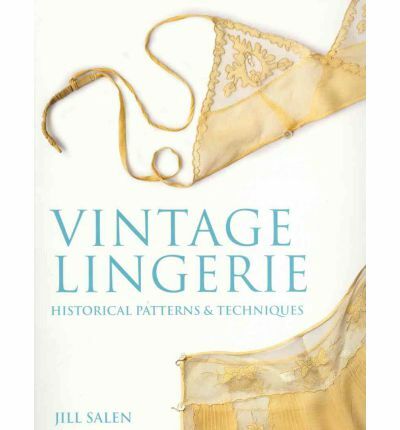 As I've gotten into vintage sewing alongside my regular historical work, I decided to buy Jill Salen's book on vintage lingerie - Corsets is very good, so I was fairly sure Vintage Lingerie would be as well. And it is! This book is an excellent resource for both vintage enthusiasts and fashion historians/collections managers who have anything to do with 20th century dress. 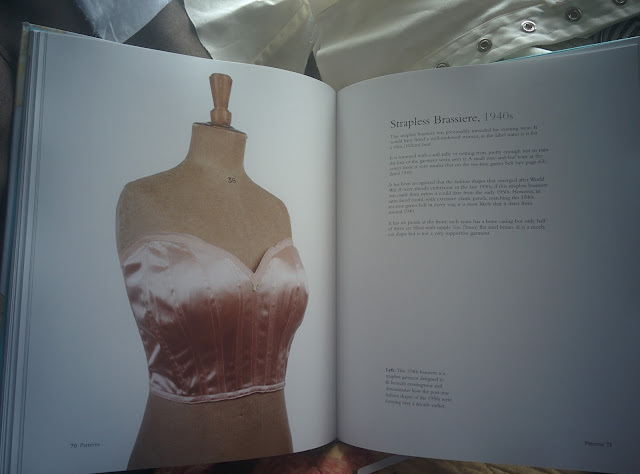 Where Corsets overlapped with Waugh's Corsets & Crinolines (just as Patterns of Fashion and Cut of Women's Clothes overlap), Vintage Lingerie really stands alone - no other books that I'm aware of give patterns for so many pieces of lingerie, especially going so far into the 20th century. The value of the book is in the patterns. The text itself has a tendency to editorialize about corsetry - which, as you're probably aware, is one of my big pet peeves - eg, "inconvenient, unsightly, even tormenting control," "finally achieved freedom from restrictive garments," "at a time when waist suppression was still extreme," etc. but the text is not at all the point, so it's easy to overlook. While I would have liked more detail in the descriptions, there is nothing at all lacking in the patterns themselves, which I have to admit put mine to shame. Salen even draws the garter clips! The dates are sketchier than I'd like - I'm not a fan of decade-dating, because it's rare that something appears to be appropriate from one end of a decade all the way to the other - but again, they're not really the point. What makes the book such a phenomenal resource is that you have the construction of the garment laid out in front of you, and you can do with that what you will. The historian can compare fully-finished clothing in a collection to the deconstructed patterns; the vintage enthusiast can, with patience and skill, enlarge the patterns to wearable size and make period-accurate underclothes. I love Corsets, so I'll have to check this book out, too! I love that "typical" as well as "atypical" pieces were included--I feel that Corsets is like that, too. It makes for nice comparison and interesting study, but still useful if you're looking into norms. Waist training is one of the best natural methods to losing weight. That's why I like to buy corset trainers for myself. Does corset waist training suitable for men?